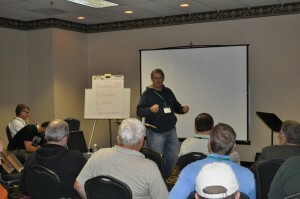 Tony Webb leads a session at the East Focus Retreat, which began yesterday (Monday, October 25) at Ocean City, Md. Grace Brethren pastors and ministry leaders in the eastern United States have had the opportunity this week to step away from their ministries and reflect on their own lives in Christ. The East Focus Retreat began Monday afternoon (October 25) at Ocean City, Md., and concludes tomorrow (Wednesday, October 27). Dr. Tony Webb, executive director of Vision Ohio, the Grace Brethren church planting group in the Buckeye State, and Dr. Terry Hofecker, pastor of Northwest Chapel Grace Brethren Church, Dublin, Ohio, are leading the sessions. They have challenged ministry leaders to examine their own hearts and their relationships with God. They have shared struggles that helped them see the core of their identities and strengthened their walks with God. Meal times at the East Focus Retreat are often times for sharing with one another. This afternoon, many scattered to do a variety of things, including golfing, shopping, reading, walking, and spending time with God. Tonight’s session included a time of sharing how He met individuals throughout the day. The retreat concludes late tomorrow morning. 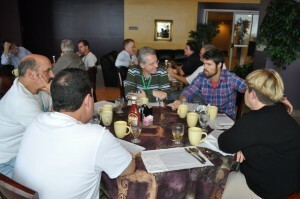 See photos of the event at the FGBC World Facebook page. Click here.